A coworker and I went to Belmont to drop off a process controller at a distributor to get it modified, and we stopped by a restaurant for lunch. Good Bites Cafe is a restaurant that specializes in Filipino and Greek food! It’s a weird combination, but all the dishes that we got were tasty! And this place is in Belmont, of all places! I don’t think there are as many Filipinos in the Peninsula as in East Bay and South Bay. Orders were taken at the cashier before grabbing a table. My coworker got a Greek dish, and I got tocilog. We were served flat bread with a special hummus mix as soon as we were seated, as a complimentary appetizer. Sweet Bite’s tocilog came with sweet bacon with eggs, garlic rice, and salad. You could also opt for chicken instead of pork, and the eggs are also cooked according to your preference. I got pork (the true definition of bacon…) and had my eggs sunny side up. The name ‘tocilog’ seems to be a shortened name of tocino, sinangag at itlog, which literally translates to ‘tocino, fried rice, and eggs’. Some places have ‘tocilog’ spelled as ‘tosilog’. 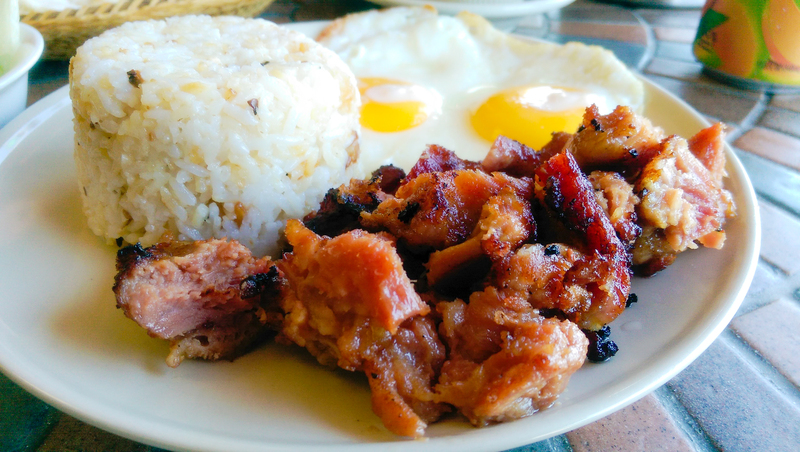 Read on for more info about tocilog/tosilog and tocino. In Philippines, tocino is usually served with garlic rice (sinangag) and fried egg (itlog), Filipinos used to call this combination as tocilog and it is best when eaten during breakfast time. Tocino is bacon in Spanish and is traditionally made with cured pork belly. In the Philippines, it’s made with either pork or chicken. Old school practice for tocino uses sugar, salt and saltpeter with maybe a little pineapple juice for tartness. It’s then left to cure for at least 3 days. In some regions, the meat is actually fermented at room temp to achieve a sour flavour to the meat. Tocino is bacon in Spanish, typically made from the pork belly. The meat is sliced into thin strips. Anise wine, annatto, water, sugar, and salt are combined in a container. Each strip is then sprinkled with the mixture and stacked in a separate container, which is covered and kept refrigerated for about three days to cure. Tocino is traditionally boiled in water (just enough water to cover the meat) or fried in oil, or is cooked over medium heat until the fat is rendered. The original tocino is marinated only with salt, sugar, and saltpeter, although pineapple juice may be added for a slightly tart flavor. Kapampangans who make tocino mix it for 4 to 6 hours in order to achieve the thickness and softness of the meat, then leave it overnight at room temperature before serving it, a dish they call burong babi (fermented pork). Tocino is often eaten with garlic rice and fried egg in a dish called “Tosilog” (short for “tocino, sinangag at itlog”, referring to the dish’s three components). Yum! I do like tacilog, but sometimes I find some restaurants make it too greasy. The garlic rice is so yummy!!! You’ll like this place then! It’s not too greasy. Filipino dishes tend to be greasy in general, so it’s def hard to find a restaurant that makes it just right!